This document describes how to set up Mac OS and Windows computers to work with Zebra's EMDK for Android software development kit. EMDK extends Android Studio with tools to interface and configure Zebra Android devices and their peripherals, including imagers, scanners and serial ports. EMDK tools enable developers to easily create powerful line-of-business applications that help maximize workflow efficiency. Note: Zebra recommends OpenJDK, which is bundled with Android Studio 2.2 and higher. 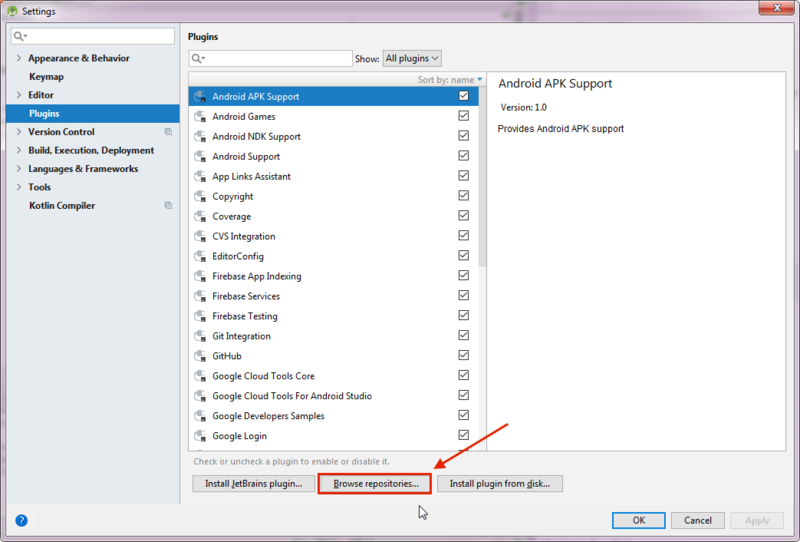 The following instructions apply to Android Studio, which is required to use EMDK for Andriod and must be installed to complete the steps below. If necessary, install Android Studio before proceeding. Note: Mac OS and Windows dialog boxes might vary slightly. Uninstall prior EMDK installations and related files, if any. a. Open an Android Studio project (if not already open). b. Select File -> Project Structure. 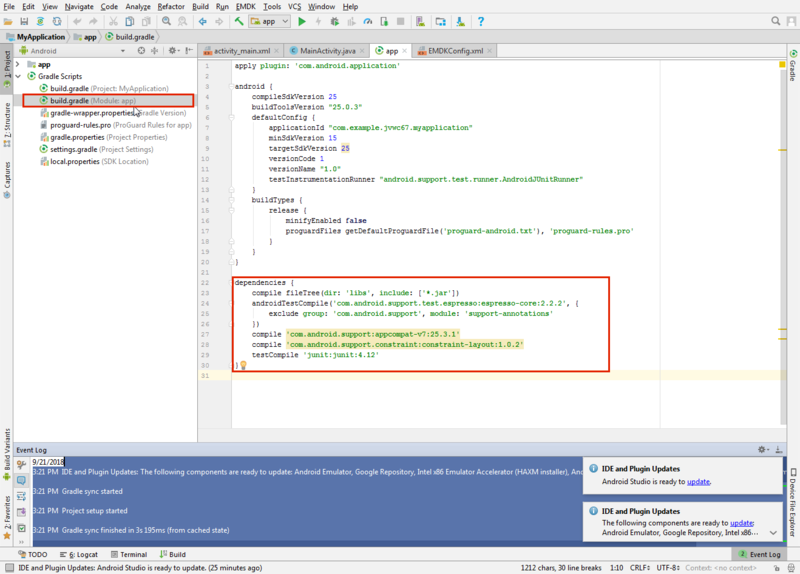 c. In the left-hand pane select "SDK Location" (if not already selected). d. Confirm that "Use embedded JDK (recommended)" is checked. Click OK.
a. In Android Studio -> Preferences. b. In the left-hand pane, select "Plugins" to bring up Plug-in settings. • If no result appears, skip to Step d.
Click to enlarge; ESC to exit. • If any version prior to 7.0 appears, select it and click the "Uninstall" button. 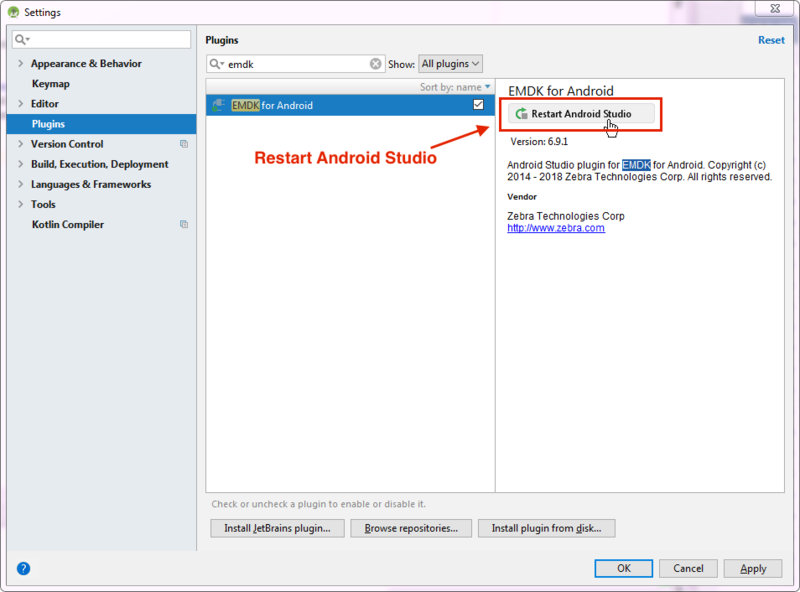 • Click the "Restart Android Studio" button. • Select File -> Settings. • In the left-hand pane, select "Plugins" to bring up Plug-in settings. • Proceed to Step d.
Click to enlarge; ESC to exit. Dialog boxes might vary from one version to another. e. Enter "emdk" in the search box. Then click "Search in repositories" as below: Click to enlarge; ESC to exit. h. Click "Restart" to confirm and restart Android Studio. a. Create or open an Android project. Rebuild the project (Build -> Make Project). EMDK APIs are now ready to use. A plus sign ("+") can be substituted for a major or minor version number in the dependencies section. For example, declaring com.symbol:emdk:7.1+ uses SDK versions 7.1 and newer. The Java version used to compile a project is based on the compileSdkVersion selected for the project. Different versions of Android support different versions of Java. If necessary, the default Java version can be overridden. Learn more. Close Android Studio, if open. From Windows -> All Programs -> Symbol EMDK for Android, select "Uninstall." Follow prompts to complete the uninstallation. Note: This process references folders that are hidden by default. To unhide, see section below. Navigate to the /Users/[userName]/Library/Android/sdk/add-ons directory. Navigate to the /Users/Shared directory. Remove the "Symbol EMDK for Android" folder. 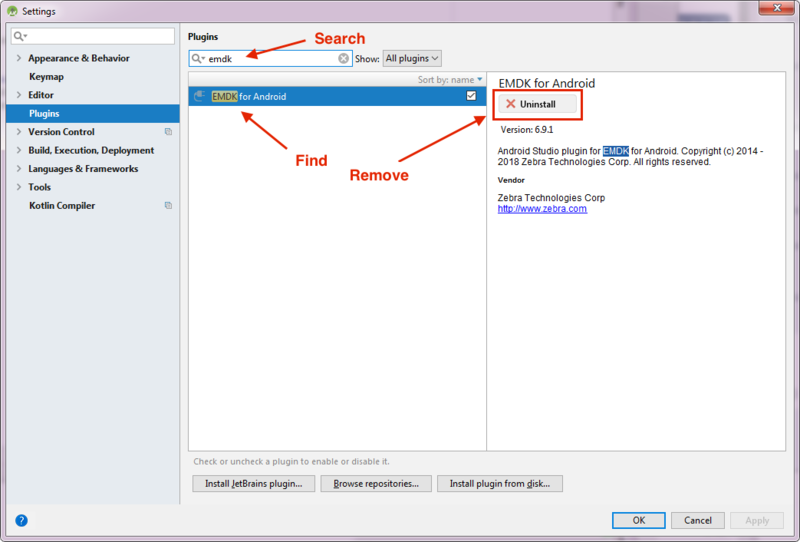 Locate and right-click Android Studio app. Select "Show Package Contents" from the menu. Navigate to Contents -> plugins directory. Remove com.symbol.emdk.wizard.intellijIdea folder, if present. Open Terminal app (in Finder -> Applications -> Utilities). Right-click on the Finder icon (in the Dock) while holding the "Option/alt" key. Select "Relaunch" from the menu to make hidden files visible. To reverse, replace "YES" with "NO" in the Terminal command and repeat Step 3.